What is the purpose of a blind spot mirror? 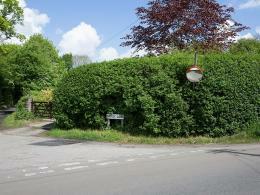 It is a well-known fact that turning a blind corner is one of the most common causes of motor accidents. Despite several other safety measures such as traffic lights, speed ramps and traffic signs, most drivers tend to be unaware of the dangers “lurking around the corner”, as it were. The situation is worse when a motor vehicle and a pedestrian are involved, naturally. This blind spot mirror is an ideal solution for those who want to remove blind spots at turnings, blind intersections, on driveways and other accident-prone locations. It dramatically enhances visibility and ensures that accidents in these places are brought down to a bare minimum - these particular safety mirrors are sometimes called Trixi mirrors. Where can a blind spot mirror be used? 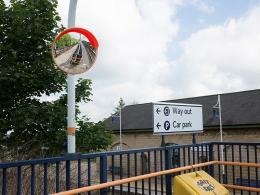 This product can be used at most locations where blind corners pose a traffic hazard. It is typically used at turnings, street corners where visibility is restricted, private and commercial driveway entrances and such locations. It can also be used wherever there is a need to ‘see around the corner’ or ensure that the path is clear before moving a vehicle. This product is primarily a piece of vehicular safety equipment, but can be used for numerous purposes besides. With the possibility of indoor and outdoor use, blind spot mirrors can also be used in busy warehouse environments as safety mirrors. Safety officers and traffic personnel are usually the main users of this product. However, because it is versatile and can be used in a number of places. 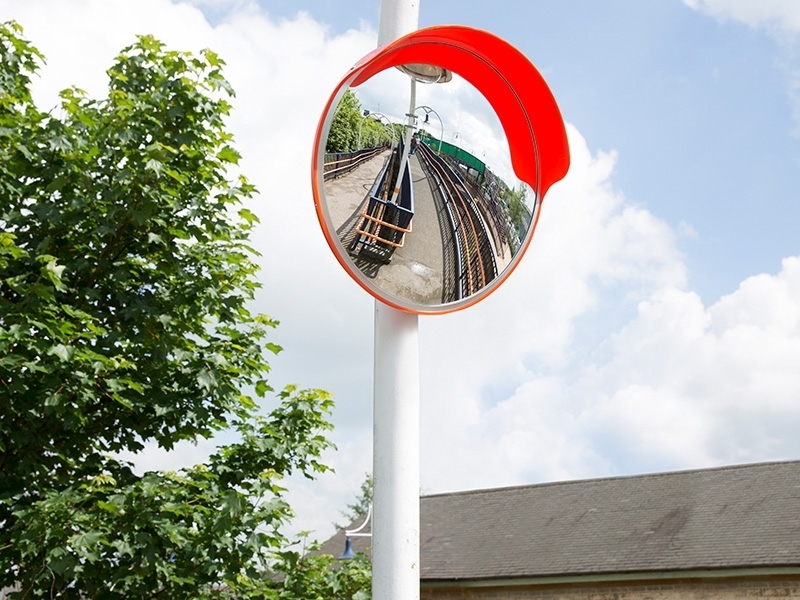 This product can also be used as a driveway mirror, security mirror or traffic mirror in premises such as warehouses, car parks or private driveways. This robust acrylic mirror ensures maximum durability – unlike glass – and longevity no matter what the local climate. Glass is susceptible to damage from the elements as well as by humans; therefore, anyone who needs a solid product that will last for years will find great value in this product. 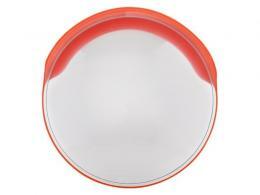 The blind spot mirror is convex in shape, giving maximum visibility when installed on corners or blind turns. The molded acrylic frame and integrated hood provide adequate protection and glare control in direct sunlight. Included in the order are the post mountable (60mm) fixtures that offer convenience and flexibility. The product offers superior optical qualities with its 1.5mm acrylic face, and the product is completely weatherproof, therefore ideal for outdoor use. 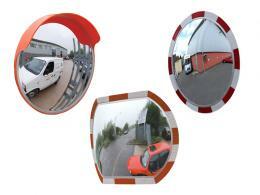 The Workplace Depot offers a standard one-year warranty on all parts and labour for our convex mirrors. Our blind spot mirrors fully comply with all local council and government regulative manufacturing requirements to ensure the safety of your customers and staff. 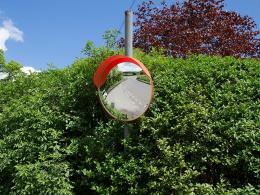 Blind spot mirrors or Trixi mirrors are nothing more than functional convex mirrors. As such, these convex mirrors are used in a variety of settings. Undoubtedly, the most entertaining ones are used in amusement parks - at the House of Mirrors exhibit. Convex mirrors allow a greater field of vision, thereby “stretching” the image, while concave mirrors “compress” the reflected image. Both types are used in funhouses, along with a myriad of other surface shapes. Tip: Most people get confused between convex and concave mirrors, not knowing which one is curved inward and which outward. An easy way to remember this is to think of a ‘cave’, which is always considered as a recess within the bordering wall or rock; concave mirrors, therefore, are the ones that curve inward, just like the appearance of a cave.